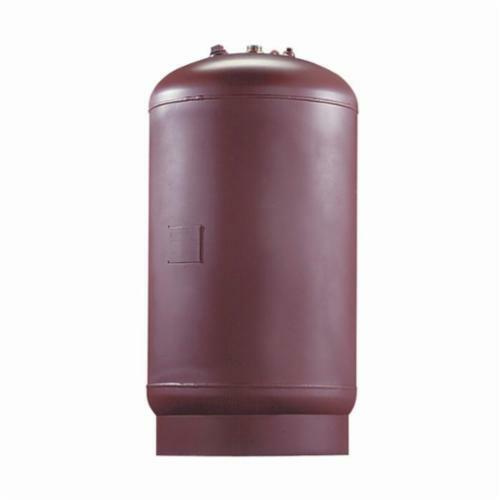 Series DETA ASME Potable Water Expansion Tanks are used on commercial and industrial potable hot water applications to absorb the increased volume of water created by thermal expansion. It also maintains balanced pressure throughout the potable water supply system by keeping system pressure below the T&P relief valve setting. It has a field-adjustable carbon steel tank (prime painted exterior) with an FDA-approved and fixed, Butyl rubber bladder, stainless steel NPT male inlet connection, and a.302 to 32 in. ( 7.6 to 813mm) charging valve connection (standard tire valve) for on-site charging of the tank. It is pre-pressurized and precharged to 40psi (275.8 kPa). ASME, Section VIII approved. Maximum Design Pressure: 150psi (10 bar).